Certain Continuing Education (CE) credits are easy to track, but how do you manage different credit types, credit values, jurisdictions and requirements? Many of the available tools can’t handle complex CE reporting scenarios in industries such as financial, legal, accounting and healthcare. As a result, much of the work is manual and frustrating. 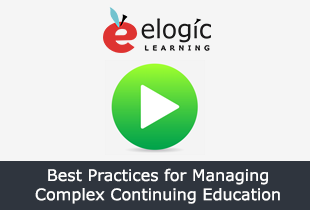 in this informative session, John Leh, CEO and Lead Analyst of Talented Learning, and Bill Snowdon, CTO of eLogic Learning, discuss Continuing Education market trends and tips to manage rapidly changing and complex CE requirements. We cover some key market statistics in the continuing education industry. These are tools and tips that will help you manage CE better, faster, and more accurately. Hear some stories from the front line of eLogic clients who are in the CE game and winning. We go over the levels of support available and which you'll want for your continuing education efforts.